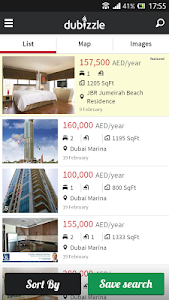 Looking for property in the UAE? 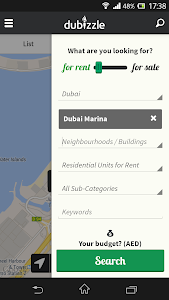 Fear not, the dubizzle UAE property app has taken the experience of searching for real estate to a whole new level! Find the property you want & have fun doing it. Our geolocation enabled app lets you find properties for rent or sale near you, while you’re on the go. Scroll, pinch, swipe & tap, it’s simple! 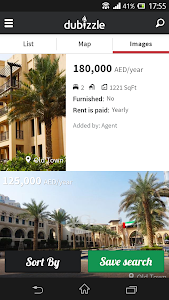 Whether you're looking to rent a studio in Dubai or buy a 12-bedroom palace in Abu Dhabi, this nifty property app allows you to easily filter through a pool of listings in a simple manner. With the most properties and the best user experience, this is an app to have. • It has three view options for you to choose from! 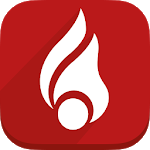 Search in map, listing (classic) or photo view. • It’s smart, with geolocation technology. It showcases apartments & villas in your community on a map, then while remaining on the map you can look at the property listing details. This means no more shifting back and forth between pages to know more about the listings you like. Yay! • It’s simple. Contact the real estate agent or developer directly in-app by choosing to call, email or SMS through your enquiry. • It’s all about quality. 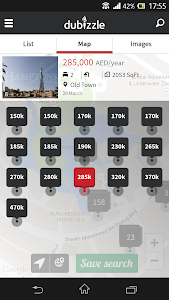 View properties in a new hi-resolution image mode as well as the standard detail mode. • It’s convenient. 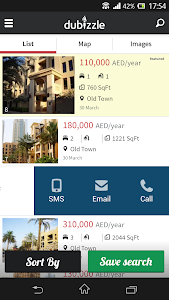 Save searches on your mobile, on the go, so it is easy to find the property you are looking for the next time you launch back into search mode! • It makes your life easier. Add properties to your favorites list, so you can go back and contact the agents or owners once you’re done picking out the properties you like best. Our cool new action features will make this a super fun experience! We’ve just made finding a property, simply awesome. 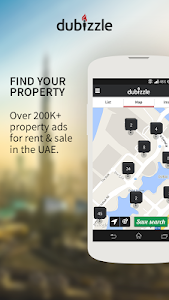 Download the dubizzle property app now and give it a try. Similar to "Real Estate by dubizzle"